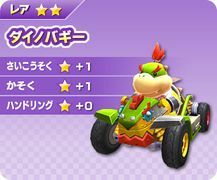 The Dyno Buggy is Bowser Jr.'s kart in Mario Kart Arcade GP DX. It features stat increases to Speed and Acceleration. It is shaped after Bowser Jr.'s head, with gears for eyes, bolts for horns, and screws for nostrils. It also has eyebrows and hair as other facial features. Its colors are based on Bowser Jr., with a green and yellow body and areas of red. Its Type S alternate colors are red and blue with areas of yellow; Type X's is gray and red. The name is similar to that of "Dino Buggy", with "Dino" instead being "Dyno", which is short for "Dynamometer", a device used for measuring force or power. This page was last edited on March 6, 2018, at 18:47.